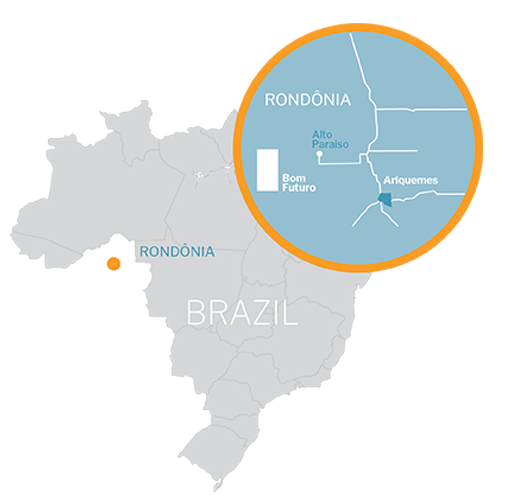 Meridian is focused on assets in the the state of Rondônia in northwestern Brazil. The Bom Futuro mine is located in the Ariquemes tin district, approximately 300 kilometres north of the Meridian’s manganese project at Espigão. The Ariquemes tin district is located approximately 300 kilometres north of the Meridian’s manganese project at Espigão and has produced approximately 3% of the world’s tin over the last 30 years. 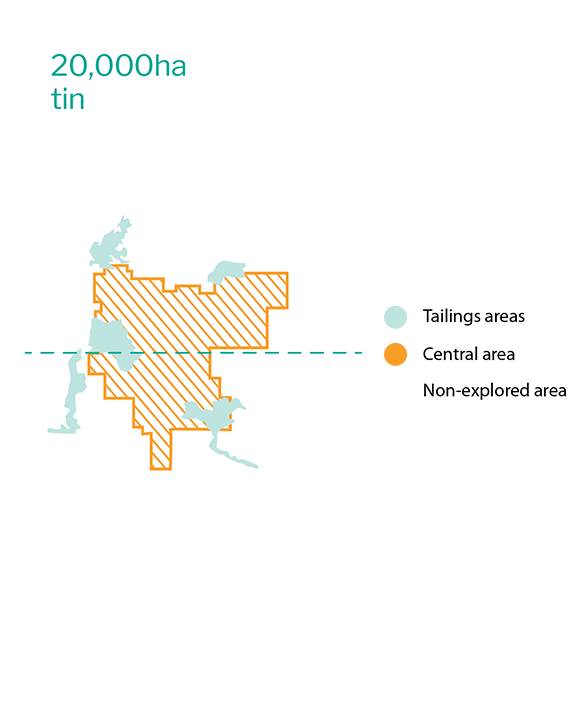 At the heart of the region is the Bom Futuro tin mine, which has officially produced 192,000 tonnes of tin since 1987. Following the initial discovery of mineralization by a woodcutter clearing trees for a road, the region was soon home to thousands of artisanal miners (called garimpeiros). These early miners worked the alluvial and colluvial mineralization using an array of basic recovery techniques achieving modest recoveries (~50%). At its peak the Bom Futuro mine was producing 30,000 tonnes of tin per annum. The Bom Futuro mine centres on a hill that protrudes from the adjacent landscape. The hill covers an area of 130ha and is cut by a series of tin-bearing veins and pegmatites. The surrounding area is largely covered by a veneer of younger unconsolidated sediments which hide the basement rocks. Primary mineralization from the hill has been dispersed into the surrounding sedimentary sequence. Cassiterite, the tin oxide mineral can be heavily concentrated in old channel systems (palaeochannels), forming placer deposits. These palaeochannels can contain many kilograms of tin per cubic metre and several have been found immediately adjacent to the hill. The Bom Futuro project has generated nearly 130 million tonnes of mineralized waste. Over the last few years, the Cooperatives have re-processed some of the tailings associated with historical production generating nearly 7,000 tonnes of tin since 2010. This suggests there are significant opportunities to further optimize tin recoveries through developing a thorough understanding of the tailings resource, its metallurgical characteristics, and the application of modern technologies for recovering tin in all size fractions. Meridian currently has access to more than 875ha of tailings for re-processing. In March 2017, Meridian exercised its option to acquire an interest in three areas of the Cooperatives’ operations. This includes has the right to provide tailings reprocessing services to the Cooperatives on certain areas (currently 880ha); a right of first refusal on either the acquisition of the mineral rights or the provision of underground mining services in the 2,000ha Central Area; and the ability to earn 80% of the 18,000ha Unexplored Area surrounding the existing Bom Futuro Mine, which also includes the right to exploit the area prior to the completion of the exploration phase. In exchange Meridian is required to finance the completion of a partially constructed 69kV power transmission line between Bom Futuro and Ariquemes. The Company can recoup the costs of the construction through cash payments or by offsetting costs for consumed electricity. The Cooperatives have granted Meridian a Tailings Reprocessing Permit for the Tailings Area for a term of five years, which can be extended for a further 5 years, provided Meridian completes USD$1.5 million in exploration work on the area. In compensation for the tailings reprocessing services, Meridian will receive cassiterite concentrate pricing less a 20% treatment charge and a 3% royalty payable to the Cooperatives. Meridian is required to spend USD$10.5 million on exploration on the Unexplored Area over five years. Upon completion of the exploration expenditures and a NI 43-101 or Joint Ore Reserves Committee Code compliant feasibility study showing economic potential, the Cooperatives will assign and transfer the rights of the Unexplored Area to a special purpose company (“SPC”). The SPC will be set up by Meridian and Coopermetal for the mineral and commercial exploration of this area, in which Meridian will hold 80% interest and Coopermetal 20%.